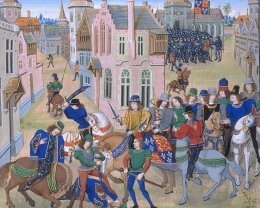 The Peasants Revolt of 1381 was the first popular uprising in England. The peasants were objecting to high taxation and demanding payment of wages in money. They marched on London, but were fooled by the King, and their leader, Wat Tyler, murdered. A contemporary chronicle of the Reasants' Revolt and the murder of its leader Wat Tyler.